Just when I thought I’d eaten enough houmous to keep me going for at least 10 years, I go and bloody make it from scratch (I’m foolish like that). When I was a student, I used to get drunk and make houmous and minted potatoes in the middle of the night, instead of staggering to KFC like everyone else. Although thinking back on it, perhaps KFC was the safer option, no one should operate a food processor after 4 white wine spritzers but what can I say, I’m a houmous wielding maverick. Anyway, much like my baked falafel recipe, the type of canned chickpeas you use is really important. I like the big fat juicy ones that Napolina do, most supermarket own brands are too bullet like. Use a food processor if you prefer a smoother texture and a hand blender for a more rough pâté. I’ve used a food processor on this occasion but I’ve made this recipe many times with a hand blender to save on washing up. 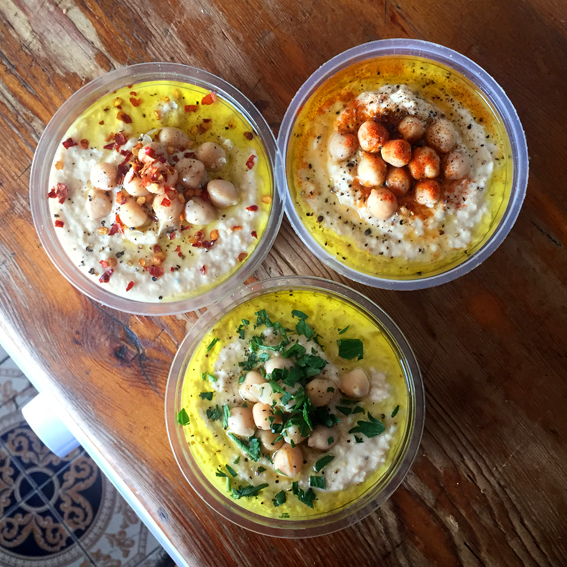 Although making houmous is easy, it can go pretty wrong pretty quickly if too much liquid is added, so make sure you have an emergency can of chickpeas spare. Adding an extra can of chickpeas can save any sloppy houmous disaster (of which I have had several). 1. Drain and rinse your chickpeas before taking a small handful and putting them to one side (these are for your garnish). Pop the rest of the chickpeas in a food processor with your crushed garlic. Half fill one of the empty cans with water and spoon 4 tbs of it onto the chickpeas and blitz. 2. Blend for a couple of minutes until smooth. Meanwhile scoop 4 tbs of tahini into the half filled can of water and mix until combined (it should look curdled but loose). Squeeze in the lemon juice, mix and pour half the can on top of the chickpeas. Blitz again. 3. 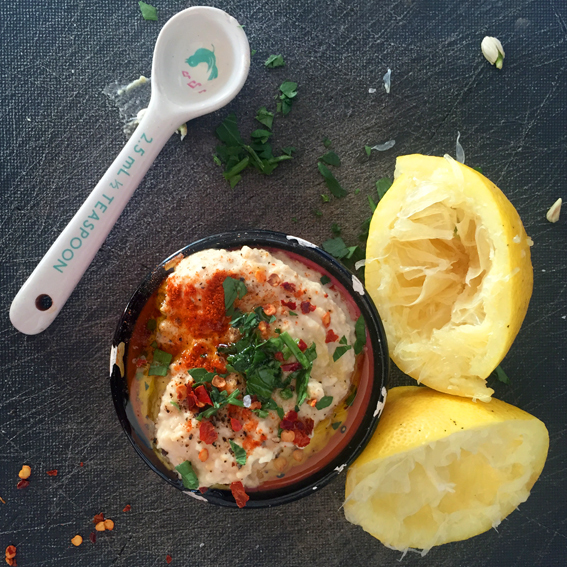 Once the houmous has come together it’s up to you how wet you want it so add a bit more of the tahini and lemon water if you want a more loose consistency, this is down to personal preference. If it’s too wet then drain your emergency can and add it to the mix and blitz again (trust me, it will help). 4. Season with half a teaspoon of salt and a good pinch or pepper and mix thoroughly with a spoon. Keep tasting and seasoning until you get it how you like it. 5. Spoon into pots and top with the left over chickpeas. Sprinkle your chosen garnish and drizzle with extra virgin olive oil. Finish with a final dusting of salt and pepper. You can eat your homous straight away if you wish but I like to chill mine for a few hours to allow it to firm up a bit. Anyway, whenever you decide it’s ready, grab a spoon and eat it like a yogurt, I know, I’m a savage.